What are TAN and TBN? Q What does Lab One Inc. test? A Lab One, Inc. performs tests on all Petroleum Based products and Engine Coolants. Q My report shows numbers, what do they mean? for example your report shows Copper 25. That indicates that in the test sample their were 25ppm of Copper in your sample. Q Why is Viscosity reported in Centistokes? A The customer number is located over your name and address on the bottom left of your reports. 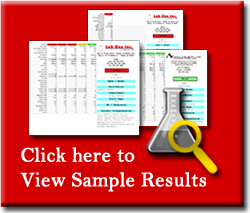 Q How long does it take to do a "Basic Oil Test"
A In most cases the Basic Oil Test results will be emailed to the customer by the next business day. Q I have regular service performed on my airplane. Why do I have to spend more money on oil analysis for something my mechanic could tell me? A Your mechanic is very much like the doctor who gave you your last flight physical. The Dr. examined the outside of your body and listens to the inside, just as the mechanic does to the engine. At the end of the exam the Dr. took body fluids to see what is going on inside. This is the same as the mechanic taking an oil sample and sending it to the lab. The mechanic can see what has happened by compression checks and boroscoping, but the oil analysis forecasts future wear, by seeing particles under 10 microns. This forecast can allow you to fix problems before they become serious ones and by doing this you can save a lot of money. Q Are all labs the same. Can I bring my oil to my local “CAT” dealer to have an analysis done? A Most labs can come up with the numbers, although they may vary depending on what kind of spectrometer they are using. Since aircraft engines are quite different from ground engines most labs will not be able to correlate the values to the source. Lab One Aviation has been testing aircraft since 1985 and can convert those numbers into a comprehensive report spelling out where any problem may exist. That is the difference between a lab and Lab One Aviation. Q How soon will I get my results? A All samples are processed within 24 hours of receipt. A phone call is made in any case we would deem critical to the safety of flight. Reports can be e-mailed and will soon be available on our web-site. Q If I am buying a used airplane would oil analysis tell me anything? A Yes! If the engine was having any serious problem it would show higher wear metals than we would have for the average limits we have developed for each engine. Oil analysis is always best if done on a “Trend Basis”. What you are looking for is a deviation from what is normal for “Your” engine. All engines make metal, some more and some less. By developing a trend you will find out what is normal for your engine. Since we are referring to ppm (parts per million), even if your engine is on the high side of the average it does not mean that your engine is wearing out faster, nor conversely if it is on the low side that it will last longer. Q If I purchase an airplane that has been on oil analysis can I continue? A All of our records are proprietary to protect our customers. Therefore, we would have to have written permission from the previous owner to do so. If you have a copy of a lab report on the aircraft from another lab, send it to us and we can input the information into your report as previous history and this would give you continuity. Q Can I use this kit to do a sample on something other than my airplane? A Yes, we also can test cars, trucks, boats, motorcycles, construction equipment and basically any oil wetted area. The report form will look different because of the fact that on other equipment the elements we test for are different and more of them. These elements are not relative to aircraft engines. On experimental aircraft, where automotive engines are used, we would do a ground report. If you have a fleet of trucks or a business that has other types of equipment, which could be tested, contact us for more information pertaining to our ground equipment side for a quote. Q Do I send my oil filter in each time with the oil sample? A No, a filter analysis should only be done when there is a problem. It would be recommended that the filter be saved until the oil analysis is completed just in case the analysis shows something abnormal and filter debris can be used to resolve anything questionable. If you have only a screen it would be prudent to back flush it into a coffee filter and save that until the results come back.